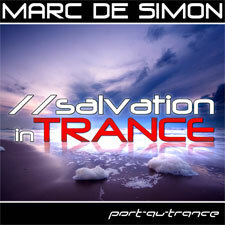 Marc de Simon – "Salvation in Trance"
One year after Marc de Simon's previous album "A-Life" has been released, the artist presents his third album "Salvation in Trance" now in collaboration with Port-au-Trance Recordings. The new album features cutting-edge tracks in modern trance sound, which are similar to a kind of "salvation" due to their freshness, and it is characterized by the typical style of Marc de Simon. Stunning melodic elements, progressive tracks with the potential to become big hymns, balearic, and dreamy elements will take you on a fantastic voyage into the world of trance music. The album contains absolutely new tracks like "Stars of Scandinavia", "Euphoria" and "Reversal of Fortune" as well as brilliant new 2010 versions of his greatest hits "Rainbow Sky", "Fall And Tears" or "Wings", and "China", which are really true makeovers. Beside a conclusive overall concept for the album itself, the tracklisting has been adjusted very carefully for a perfect flow. Without any doubt it can be mentioned, that the album "Salvation in Trance" is certainly the best one ever created by Marc de Simon so far - which is a proof of the constant further development of the artist.